Photo: Farmers receive seedlings from an officer at the Department of Agriculture at the Prospect Experimental Station Dec. 6. 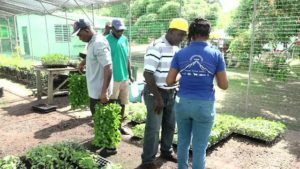 Charlestown, Nevis – Farmers on Nevis have begun receiving a share of 80,000 seedlings as part of a hurricane relief initiative for farmers conceptualised by the Department of Agriculture called the Ministry of Agriculture’s 20k Project. The project, which is a collaboration between the Ministry of Agriculture in the Nevis Island Administration (NIA), the Taiwanese Mission, the Inter-American Institute for Cooperation on Agriculture (IICA), the Caribbean Agricultural Research and Development Institute (CARDI) TDC and Tropical Blossoms Nursery; was launched at the Prospect Experimental Station Dec. 6. Randy Elliott, director of the Department of Agriculture, said the project was developed following the passage of hurricanes Irma and Maria in September. It is designed to ensure food security on the island and to reduce dependence on imported produce. The seedlings of tomatoes, lettuce, sweet peppers, cabbage, melons, honey dew, cantaloupe, squash and cucumbers will be disbursed to farmers in batches of 20,000 per month. In addition, fertilizers and poultry feed will also be made available to them. The Honourable Alexis Jeffers, minister of agriculture on Nevis, said through the project, the farmers would be better off because of the assistance from allied agencies for the project and the NIA’s $50,000 contribution. He thanked all those who partnered to make the project a reality, but used the opportunity to single out Augustine Merchant, IICA’s local representative in St. Kitts and Nevis, for his unwavering assistance to agricultural development on Nevis. The minister also thanked the Republic of China (Taiwan) for its contribution to the project and its long-standing assistance to the ministry and to the Department of Agriculture. In addition, two new tractors will provide assistance to farmers with land preparation and two pick-up trucks will assist with the transportation of workers to the various government-owned fields. Jeffers attributed the strides made in agriculture in the past five years on Nevis to the strong relationship the ministry developed with the allied agencies. John King, regional representative for IICA, congratulated the ministry for establishing the project. He said his organisation is pleased to support it, and is committed to improving the agricultural sector on Nevis and to strengthening the institution within the agriculture sector on the island. Other remarks were made by Huey Sargeant, permanent secretary in the Ministry of Agriculture; Yu-Ming Lu, project manager at the Taiwan Technical Mission. The opening prayer and vote of thanks were done by farmers Eglantine Hanley and Emontine Thompson.